We have just returned from a week stay at this hotel. We stayed full board and before travelling requested a sea view room. Unfortunately at the time we were told there were no sea view rooms available however after our first night in the hotel we were told we could move to a sea view room at no extra cost. The hotel is absolutely fabulous. The staff were all helpful and very very friendly. The food in the restaurant was buffet style but they had a chef cooking fresh meat and fish at every sitting. breakfast was a mixture of hot and cold food with the chef present again to cook omelettes and eggs and pancakes. There was a wide range of choice and there was always plenty to choose from and plenty of fruit. Entertainment was included and as it was the end of the season there was no live entertainment but a DJ playing music you could sing and dance to. The bar staff were really nice especially Jonathan. We would definately recommend this hotel to anyone wanting a quiet time. The spa is great, the rooftop pool is small but adequate and you only have to cross the road to the beach. Have enjoyed almost a week with full board at the Pi-Mar. On arrival we were greeted by a friendly receptionist and given a sea-view double room. The room and its en-suite were compact to say the least but were adequate with all the essentials, clean, tidy and with tasteful decor. The bath was only 1200mm but was OK to use and the shower above was powerfull. As others have mentioned the view from balcony is lovely and at night you can lay in bed listening to the surf. Cannot comment on the evening entertainment as we were out each evening. Breakfast choice was along continental lines with lots of rolls, toast, pastries, jams etc but also bacon, fresh fried eggs and/or scrambled eggs or boiled eggs. Occasionally there were baked beans and most mornings sliced melon or pineapple. Lunch was similar to Dinner with various hot dishes and salads. Worth mentioning were the Gateux which when available were outstanding. Best I have come across and I normally do not like deserts. Fresh fruit is also available together with creme caramel etc. The table wine is very consumable and costs 5.99 euros per bottle. 500ml of bottled water was 1.50 euros. Overall standards in the restraurant were high, the buffet was constantly monitored and any offerings running low were quickly replenished. A minor gripe were that some main dishes were not labeled which made choice difficult for discerning diners and Vegetarians. To summerise we felt the Pi-Mar was a genuine 3 star of good standards, friendly staff and situated by the beach conveniently close to town. One last thought is that less than half of the rooms are sea view so worth checking before booking. The rooms are average size and very clean.The food is varied but not exciting. The evening entertainment was boring ie just dancing and one flamenco night. This hotel is ideal for older people who want a relaxed holiday. The hotel is not suitable for children,there is nothing for them to do. The staff are friendly especially the bar manager Beauty who is very helpful. I shall be returning to this hotel soon. I loved Costa Brava, my favourite holiday to date is Blanes. I have also been to Tossa De Mar and Santa Susana. Blanes was clean, friendly and had a create atmosphere! 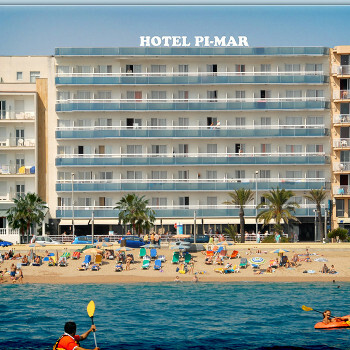 i am going back this year but to Loret de Mar, and can not wait! The only concern some people might have is the limited pubs! in scotland there are pubs everywhere! but Blanes was slightly limited! having said that me and my friends had a great time but if you are over 30 then the pubs and clubs we enjoyed (Arena and Las Vegas) might not be you cup of tea!) It was a very german and dutch oriantated place! which was fab because they are a good looking nation! there were scotish and english there but the limited few compared with the likes of Majorca etc!! I would recommend to anyone to go to costa brava i cant wait to go back and have another fab holiday!!! so look out Loret because us Scottish ladies sure no how to party! We had a very good holiday and would definitely return.